Born in Saint John, NB, Jacquie Drew began her musical training at age 4, and was taught to play chords on piano by her singing and songwriting mother. The second of three daughters, Jacquie picked up on music quickly, and her mother encouraged her girls to sing harmonies together. At age 5, Jacquie and her family followed the oil boom to Alberta, where she was fortunate to receive weekly classical piano lessons until age 18. She also joined the school bands, playing trombone, which she continued to do when she entered the University of Calgary. Times had been hard in Calgary during the boom/bust of the 80’s and 90’s, and her parents strongly encouraged Jacquie, who was a very strong all-around student, to get a “real job”! Jacquie graduated with a commerce degree, majored in marketing, and embarked on a career in sales and marketing, which allowed her to start her own consulting business. Very successful as a marketer (she was also a regular business columnist on CBC radio for 3 years), and with the flexibility her business afforded, Jacquie was able to invest in developing herself musically – taking lessons in voice, banjo, accordion, guitar, and keyboard improvisation. After a couple of seasons singing in the Calgary Philharmonic Chorus, she gained notoriety as a musician/singer in popular Calgary-based bands, the Deputies (on keyboard/banjo/vocals) and Tom Phillips and the Men of Constant Sorrow (on accordion/vocals). By early 2008, Jacquie’s performing skills and original music repertoire had reached a level where she was confident that she could front her own act, and she put her marketing and business skills into action. She released her debut CD, Rolling Wind, in June 2008. The album contained 10 tracks, including 8 written by Jacquie, and was produced with all-Canadian talent in Calgary. It was received with excellent media reviews, including a “Top 12 DIY” (do it yourself) category selection in Nashville’s Performing Songwriter Magazine. It also garnered radio airplay on CBC, CKUA and Golden West Radio, and earned Jacquie a spot in on the ECMA “Discovery Stage” at Corner Brook in 2009. Jacquie completed her second album, Red Hot Candy Heart, with the help of a grant from Rawlco Radio. The album was completed in late 2010 – with a fan-release in Calgary in October 2010, and a radio release in January 2011 . The CD featured 10 original tunes, written by Jacquie, musically crossing from country to swing. In February 2011, the album achieved a #4 national rank on the folk/root/blues chart as measured by Earshot. 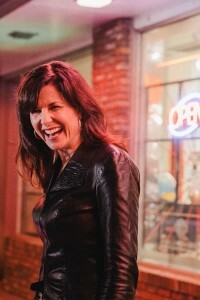 Jacquie’s latest album, “The Boss is a Woman” was released on January 17, 2015, and received airplay on over 40 radio stations across Canada. The album contains 11 original tunes written by Jacquie Drew and features the talents of “the Crew” – Steve Bridgett (keyboards), Scott Muirhead (drums), Richard Erickson (bass) along with special guests Wendell Ferguson (guitar), Dave Glowasky (fiddle) and Al Muirhead (trumpet). The album, while still in the country vein, achieves more modern songwriting and arrangements, while still relying on classic acoustic instruments. Jacquie continues to work on her songwriting and original music performances, mainly as a solo act, and this is her focus for 2018. You can find out where she’ll be performing next on the Shows page of this website.